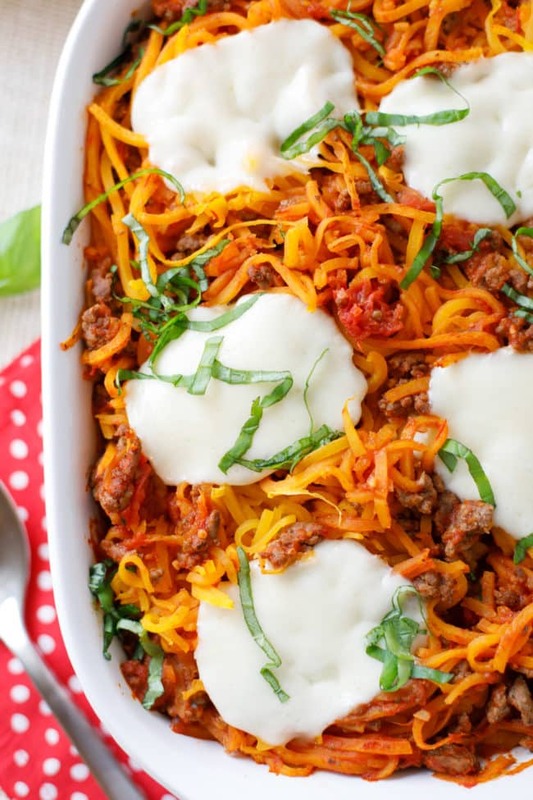 This butternut squash spaghetti bake is a tasty low carb casserole featuring delicious butternut squash noodles. Have you tried cooking with vegetable noodles yet? 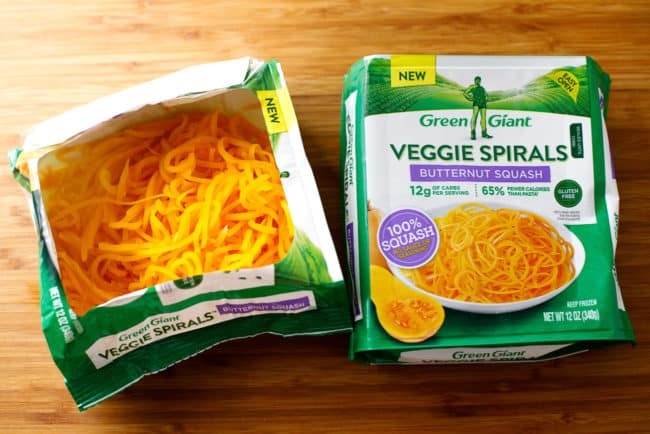 Our sponsor for this post, Green Giant, just made this cooking trend even more appealing for busy moms with their convenient frozen Veggie Spirals! While I adore traditional pasta, it’s nice to take a lighter approach to dinner. Green Giant Veggie Spirals are gluten-free and have 65-90% fewer calories than pasta. Green Giant Veggie Spirals are available in Butternut Squash, Beets, Zucchini, and Carrot. They’re truly the perfect swap-in for traditional pasta and they taste amazing. Let’s not forget about all of the nutritional value you’re getting by boosting your vegetable intake. 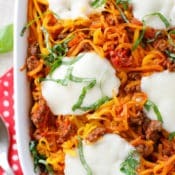 My kids love butternut squash noodles, so this easy butternut squash spaghetti bake recipe was a big hit. I don’t know if you’ve ever made your own veggie spirals, but, let’s just say there’s a bit of prep and clean-up involved. There are some nights when the last thing I want to do is have to clean vegetable scraps out of a kitchen tool before I can call it a day. The fewer dishes the better as far as this mom is concerned! I chose to microwave my Veggie Spirals because it was so quick and easy, but all of these methods take just minutes. My butternut squash spaghetti turned out great using the microwave method. The squash noodles were tender, without being soggy. The dish was truly delicious and something That I felt great feeding my family. Quick tip: just be sure you drain any excess water no matter which of the cooking methods you choose to follow. 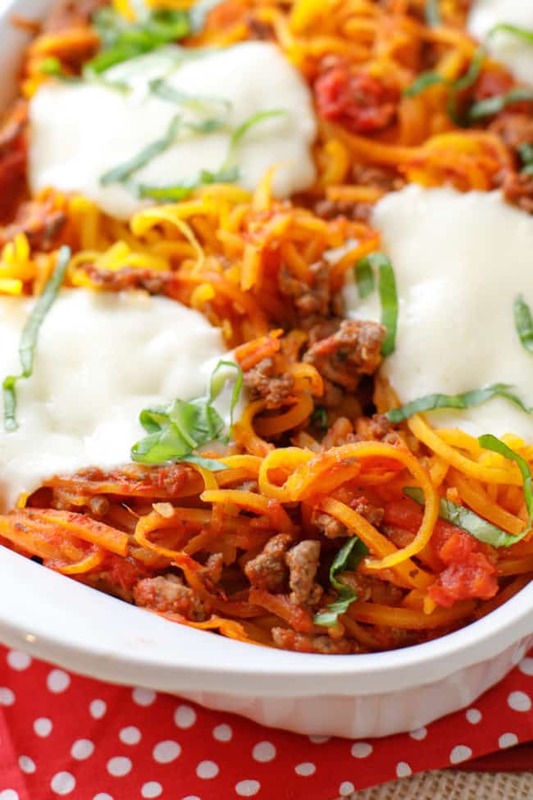 Before you pop your butternut squash spaghetti in the oven to bake, be sure to top it with several slices of fresh mozzarella cheese. Before serving, top it with plenty of chopped fresh basil. I hope you’ll give this recipe a try, and that new Green Giant Veggie Spirals inspire many more delicious dishes! 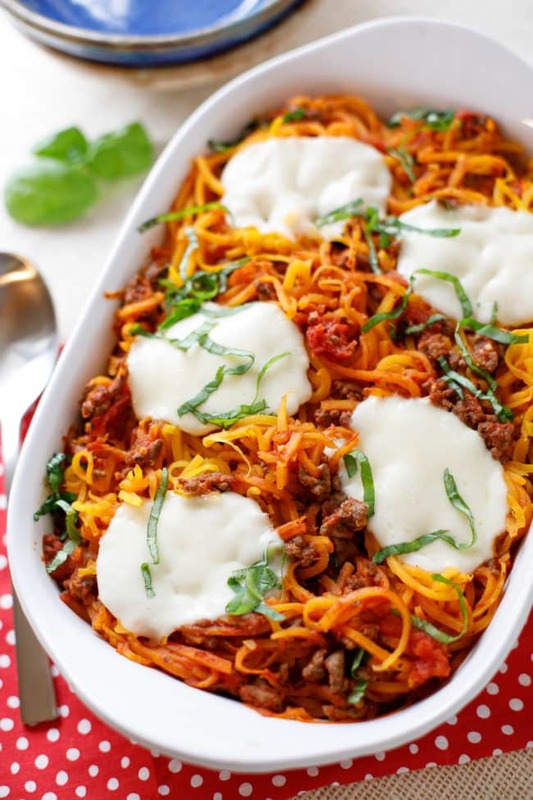 Sweet, tender butternut squash spirals and a savory meat sauce make this baked spaghetti super delicious! Heat 1 teaspoon olive oil over medium-high heat. Season ground beef with salt, pepper and Italian seasonings; brown thoroughly. Drain excess fat if necessary. Add the jar of marinara sauce and simmer on low, 15 minutes. Meanwhile, microwave Green Giant Butternut Squash Veggie Spiral packages, one at a time, following directions on the package. Drain excess water. Add the butternut squash noodles to the meat sauce and gently toss to combine. Add the mixture to a 2-quart baking dish (9×13 would also work) and cover with fresh mozzarella slices. Bake for about 10 minutes or until cheese is melted. Garnish with fresh basil, serve immediately and enjoy! Be sure to drain the excess water on your veggie spirals for best results.